Apple just released the long-awaited new 2018 MacBook Pros, and while identical at first glance, there are a lot of features that differentiate them from the 2016 and 2017 models. Both new models also include a brand new butterfly key mechanism that Apple says gives a quieter experience. With any luck, the reliability issues from the older butterfly keyboard issues have now been laid to rest, but we'll keep you up to date with that as time goes on. The new MacBook Pro is the first Mac to feature Apple's True Tone technology. The technology debuted on the iPad Pro line, measuring the ambient color balance and adjusts the screen so colors are displayed more accurately. In another first, the new MacBook Pro is now the first Mac ever to support Bluetooth 5.0. Apple also touted speakers with high-fidelity sound that are connected directly to system power, but we'll have to compare them for ourselves to see if they're actually better. Both new Touch Bar models also include the T2 Chip, which debuted on Apple's iMac Pro. It controls the FaceTime camera, the speakers and audio, system management, and the SSD, all by itself, freeing up the main CPU's power. The T2 chip also has dedicated hardware to automatically encrypt all of the data on the SSD drive, without affecting processor power. By far, the biggest change that the T2 brings across the board is the addition of "Hey Siri", making it the first Mac ever to support it. Now that MacOS Mojave is bringing the Home app to Mac, you'll soon be able to use Hey Siri to control HomeKit devices, straight from your new MacBook Pro using the technology. First of all, the base 13-inch model with function keys is literally unchanged! Nothing at all is different, and it's priced at the exact same $1299 as before. However, there are huge changes with the Touch Bar model. For the first time, Apple has made a 13-inch MacBook Pro available with four cores. The new processor is clocked at the same 2.3GHz clock speed as the base model's chip, with boost speeds upped to 3.8GHz. Both speeds are the same as last year's base 15-inch MacBook Pro's quad-core chip, except that the chip in the 13-inch is an i5 processor instead of an i7. You also have the choice to upgrade the 2018 13-inch MacBook Pro to a four-core i7 for $300, and the turbo boost clock is up to 4.5GHz. For comparison, the best available processor on last year's 15-inch MacBook Pro could only turbo boost up to 4.1GHz, so this processor should easily outperform previous MacBook Pro models when performing multi-core tasks. The graphics chip on the new model has also been upgraded to Intel's Iris Plus 655 compared to the old 650. Storage is upgradeable to 2TB of PCI-E Flash storage instead of hitting the ceiling at 1TB on last year's model. The old 13-inch Touch Bar had a 49.2 watt-hour battery, and the new model has a 58 watt-hour unit. Apple hasn't adjusted battery life estimates, so it remains to be seen what real-world impact that this will have. The price remains $1799 for the base-level 13-inch MacBook Pro, the same cost as last year's Touch Bar model. The 15-inch MacBook Pro, has even more upgrades, including the long-awaited bump up to 32GB of RAM. Both RAM options are now upgraded to 2400MHz DDR4 memory. Last year's models used 16GB of LPDDR3 memory. The DDR4 will have an impact on battery life, but the new models have a 10 percent larger battery, from 76 watt-hours to 83.6 watt-hours, so our best guess right now is that the 2018 model will be about equal to the 2017 in battery life. The all-time biggest change is an upgrade to Intel's new 8th generation 6-core processor. The new processor is clocked at 2.2GHz with a turbo boost clock of 4.1GHz, matching the turbo boost clock of last year's best CPU option. Given cache capacity and speed improvements, the new base 15-inch model should outperform the best 2017 15-inch Model in terms of single-core performance, even if you have 16GB of RAM. For multi-core performance, however, the new base model should now completely destroy last year's best MacBook Pro thanks to the new six-core chip. You can also pay an extra $400 over the base model for the top-of-the-line 2.9GHz i9 six-core processor that turbo boosts up to an insane 4.8GHz, the highest turbo boost speed ever seen on any Mac. There is now a 4TB SSD option, for an equally large price. Fully outfitted with the fastest processor, max RAM, and max storage brings the price for a fully-loaded 15-inch MacBook Pro up to a massive $6,699. Users now have the option of a Radeon pro 555X or 560X. Initial research suggests that they are basically the same chips as the 2016 model, other than a slight boost in clock speeds. We'll dive more into this in the future and get back to you. This year's new MacBook Pro models have a boost in value compared to last year. How much, though, remains to be seen. Once we get our hands on the new 13-inch and 15-inch MacBook Pro models, we'll be doing a lot of testing and comparisons, as we always do. If you want to secure your place in line, Apple authorized reseller B&H is accepting pre-orders for the new 2018 MacBook Pro with no tax collected in most states. Details can be found in our 2018 13-inch MacBook Pro with Touch Bar and 2018 15-inch MacBook Pro Price Guides. This article could use of a table, or two, comparing specs, side-by-side. It's much easier to absorb. Like on Apple's "tech specs" pages. I think Marco Arment is going to have a breakdown over this update. For me this Mac is really to get me past the first couple years of Mac in ARM. I’m looking forward to my new one arriving next week! Would have loved Face ID but I can live. I wonder whether the lack of Face ID is a problem of supply or a technical one. I trust that at some point, it will be able to recognise any number of users with separate accounts. I wonder too how many users maintain multiple accounts on their MacBooks. I have a couple on each of mine. Fully outfitted with the fastest processor, max RAM, and max storage brings the price for a fully-loaded 15-inch MacBook Pro up to a massive $6,699. there is a boost in value. In fact I would hate to spec out a comparable Dell or HP and observe the price difference. There has always been a gap, but I suspect it has become a chasm. Even if there was only one user account, the problem with Face ID on a laptop would be that a lot of the time when the machine is docked the lid is closed. Okay, I've never used a dock. An aside, with the latest Mac OS upgrade, my watch now unlocks my MB Air reliably. At last. More than 10 years ago I ditched Windows and started my kids on Macs. It was a great decision as from then on I never had to fix windows issues and my kids never had to deal with slow starts, BSOD, never ending prompts and notifications, viruses etc. You see them open up their Macs and almost immediately continue where they left off. Sure I’ve replaced their Macs to use faster and lighter ones, but I don’t usually get the fastest and meanest model. So if the price is a bit steep, I’ll wait. Save up more then buy. But I would not want to switch back to windows. Just not worth the hassle just to save a few bucks. Who knows, with Jobs gone, sooner or later the folks at Apple may grow heads that are too big for our good and start to lose respect for customers. We’ll see. Strange. I must be looking at a different Apple Website. For the same price I paid for a 2017 15" MacBook Pro with 16GB RAM and 1TB SSD, I can now buy a 2018 15" MacBook Pro with 32GB RAM and 2TB SSD. Not sure how it became more unaffordable with the 2018 release. Did they fix they keyboard? No, I didn't think so... quieter is not the problem. Stopping working is the problem, Apple. Hello?? The video is a really good comparison, covers off everything. Looking forward to your full review. Also, best CPU upgrade in years! Also, if the T2 chip in the MBP gives you Hey Siri, and the iMac Pro has a T2, how come the iMac Pro hasn't got Hey Siri too? Your definition of affordability is different than most. Most don't have few thousands to spend on laptop upgrade every couple/few years. Stupidest thing Apple did was implementing touch bar/strip/whatever called. It increased cost without much productivity/usage. Moreover, this time Apple did not upgrade function key MBP and still offers 128GB SSD. That is dumb. I think with the 2017 MBP you could argue that the Touch Bar must have increased cost significantly, because it needed a special chip, the T1, to run it. But with the 2018 model, the T2 chip also does sound, disk encryption and secure boot. So if they are going to have the chip for those other things anyway, having it power the Touch Bar as well probably adds less incremental cost than in 2017. There is still the cost of the little touch screen of course, but taking the Touch Bar system as a whole it must be costing less than last year. The video reviewer really likes the word "massive" but it kind of devalues the meaning of the word when the "massive" difference is tiny and he uses it so many times. Also, the "long-awaited" update that took a year? Sensationalist much? Anyway, I can't wait to see the "massive" differences in a proper review. I'd especially like to see the keyboard performance in comparison to the 2017 one, and whether they improved reliability and repairability (of the keyboard). 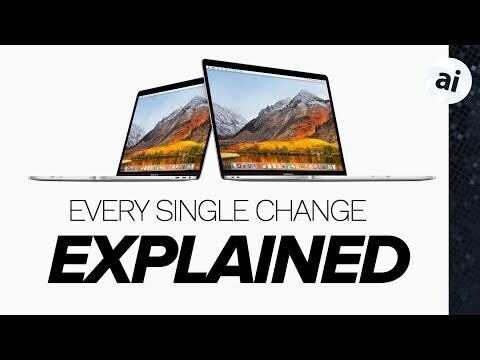 It was something they really needed to address and my only real complaint in regards to my 2017 MBP. It looks like a great update, and maybe even worthy of an upgrade from last year's model. Just pondering.. I would like Apple to make an affordable 17in laptop. Use a plastic case and make it thicker. Dell, HP, Lenovo make very nicely designed 17in laptops that is affordable and with user replaceable ram and ssd. I just dropped 3700 Canadian to get the fastest 13 inch MacBook ever produced! I've got the i7 plus 16 gigs of RAM in this sucker! I didn't splurge for the 1TB model since 512 should be enough for me. (Currently have 480 on my current MacBook Pro, which is going to be continuing its life as a media server) I am so excited it's not even funny! I was worried a little about the integrated GPU since I did want to start getting into some 3D stuff, but I figure if it isn't enough once I've fully paid off this one I can always splurge on an eGPU.